Folk magic and occult beliefs were a part of early American and Mormon culture, affecting practice and doctrine in profound ways. Despite the scientific enlightenment movement that swept across Europe, Americans of diverse social classes and education levels inherited superstitions and supernatural beliefs from the colonial period. Publishers produced many volumes and almanacs that contained astrological and mystical information. Despite a predominantly uneducated citizenry in rural New England areas, an abundance of libraries across the region provided a vast array of books of all types, including texts on folk magic and alchemy. There is indisputable evidence of the Smith family’s involvement in ritual magic. Furthermore, numerous foundational Mormon families actively believed in apparitions, divining rods, talismans, seer stones, planetary superstitions, lunar cycles, astrology and enchantments. Smith family descendants eventually donated and displayed folk magic items, including amulets, talismans, parchments, daggers, and even magical canes and handkerchiefs. D. Michael Quinn, a prolific historian of Mormonism, observed that “the official version of early Mormon history is often incomplete in its presentation of material facts and evaluation of evidence; therefore it is inaccurate in many respects. The Smith family’s folk beliefs, treasure digging ventures and their effect on Mormon revelation are perhaps the most troubling topics for Mormon apologists and polemics, who often deny legitimate sources while selectively embracing items which conveniently fit the official Mormon narrative meticulously polished over a span of two centuries.” Quinn’s, Early Mormonism and the Magic World View, is highly recommended to anyone seeking to understand how folk magic impacted early Church leaders. See Translation Process for a thorough examination of how the Book of Mormon came to be. Upstate New York and Vermont were meccas of treasure-digging. Poorer families were infatuated with stories of buried wealth, while treasure quests occasionally attracted even prominent and wealthy participants. The Smiths’ Palmyra home was approximately three miles from the Erie Canal. Public intrigue was such that a boat would “move up and down the canal, bearing the riches of science as well as the gifts of fortune” claiming to result from the digs (Wayne Sentinel, Palmyra, NY, June 23, 1824). Oak Island, the site of a tremendous amount of treasure speculation, lies near Novia Scotia. Regional treasure lore developed around the infamous Captain William Kidd, a former pirate hunter who turned pirate in the late seventeenth century. Captain Kidd adventure novels were popular in the day, and the Smiths are documented to have enjoyed them. Palmyra resident Ann Eaton noted that Kidd was Joseph’s “hero,” whose work he “eagerly and often perused” (Vogel, Early Mormon Documents 3:148). Joseph’s mother elaborated on the family’s affinity for folk magic when recording her family’s history. Lucy wrote, “Let not my reader suppose that because I shall pursue another topic for a season that we stopped our labor and went at trying to win the faculty of Abrac, drawing magic circles, or soothsaying to the neglect of all kinds of business. We never during our lives suffered one important interest to swallow up every other obligation” (Lucy Mack Smith’s Biographical Sketches). While understandably defensive of the disrepute commonly associated with money digging, Josiah Stowell indicated that the Smith’s loss of land and home in December 1825 owed at least in part to the Smiths preoccupation with treasure seeking. Joseph Knight’s personal history tells of his early acquaintance with Smith. Housed in the Church archives, this manuscript is “missing at least one beginning page.” The missing portion would likely cover the period when treasure digging was the primary association of Knight with the teenaged Joseph Smith (Quinn, Magic World View, 54). Noel Carmack, “Joseph Smith, Captain Kidd Lore and Treasure Seeking,” Dialogue: A Journal of Mormon Thought 46, No. 3. Clay L. Chandler, “Scrying for the Lord: Magic, Mysticism, and the Origins of the Book of Mormon,” Dialogue: A Journal of Mormon Thought 36, No. 4. A century before the Smiths, Benjamin Franklin addressed treasure-digging. He wrote: “There are among us great numbers of honest artificers and labouring people, who fed with a vain hope of growing suddenly rich, neglect their business, almost to the ruining of themselves and families, and voluntarily endure abundance of fatigue in a fruitless search after imaginary hidden treasure. . . . At length a mighty hole is dug, and perhaps several cartloads of earth thrown out, but alas, no cag or iron pot is found! no seaman’s chest cram’d with Spanish pistoles, or weighty pieces of eight! 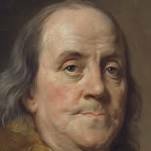 Then they conclude, that thro’ some mistake in the procedure, some rash word spoke, or some rule of art neglected, the guardian spirit had power to sink it deeper into the earth and convey it out of their reach” (Benjamin Franklin, The Papers of Benjamin Franklin 1: 134–39). Though often portrayed as harmless folklore, Franklin’s commentary reiterates that the practice was perceived as long ago as the Colonial Era to be unscrupulous and even fraudulent. In Smith’s day, defrauding others with claims of lost treasure was illegal. JOSEPH SMITH’S FAVORED BROWN SEER STONE. The Smith’s Manchester neighbors included the Chase family, known treasure diggers. When young Joseph learned of Sally Chase’s reputation for locating lost objects using her blue-green seer stone, he persuaded his parents to let him visit her. Upon gazing into Sally’s stone, Smith envisioned an opaque white rock of his own. He described the stone as being located under a tree near Lake Erie, some distance away. Joseph’s father suggested that Joseph obtained his first stone at “about fourteen years of age.” Historian Dan Vogel suggests the event occurred “probably in 1822 when he was sixteen years old” (Vogel, Early Mormon Documents 1: 457). This timeline aligns with Smith’s confession at his 1826 Glass Looker trial to have been engaged in scrying for three years. In 1822, Willard Chase hired Joseph and Alvin Smith to help dig. Some historians have suggested that they were digging a well, while others have described it as a treasure hole. Lorenzo Saunders, a brother-in-law of the Chases, claimed that Joseph’s brown rock was found while digging a treasure hole with the Chases, not for the Chases, who likely told others they were digging a well. “They dug that hole for money,” Saunders wrote, “Chases and Smiths altogether was digging it” (Lorenzo Saunders interview, Nov 12, 1884, in Quinn, Magic World View, 42-46). Regardless of the timeline or intent, many sources both friendly and antagonistic have confirmed that Smith obtained three peep stones (seer stones) as a teenager. Dan Vogel’s examination of this period led him to conclude that Joseph “was an aggressive, ambitious leader among Manchester’s treasure seekers” (Dan Vogel, Joseph Smith: The Making of a Prophet, 35). Elder Steven E. Snow, LDS Church Historian, noted: “By 1825, young Joseph had a reputation in Manchester and Palmyra for his activities as a treasure seer, or someone who used a seer stone to locate gold or other valuable objects buried in the earth” (Steven E. Snow, “Joseph Smith in Harmony,” Ensign Magazine, September 2015). In an 1859 interview, Joseph Smith’s early scribe and confidant, Martin Harris, recalled: “There was a company there in that neighborhood, who were digging for money supposed to have been hidden by the ancients. Of this company were old Mr Stowel-I think his name was Josiah-also old Mr. Beman, also Samuel Lawrence, George Proper, Joseph Smith, jr., and his father, and his brother Hiram Smith. They dug for money in Palmyra, Manchester, also in Pennsylvania, and other places. When Joseph found this stone, there was a company digging in Harmony, Pa., and they took Joseph to look in the stone for them, and he did so for a while, and then he told them the enchantment was so strong that he could not see, and they gave it up” (Joel Tiffany, “Interview with Martin Harris,” Tiffany’s Monthly, August 1859). Joseph used his seer stones in the same manner as Sally Chase, by placing the stone in his hat and then burying his face in his hat to block out the light. It was through this method that Joseph’s mother said he was able to see things “invisible to the natural eye.” Lucy also recounted how Sally Chase aligned with competing treasure diggers and would use her green stone years later to discover where Joseph hid the gold plates (Smith, Biographical Sketches, 91–92, 109). Lucy Smith validated her son’s treasure digging expertise and related employment when discussing Josiah Stowell’s 1825 journey to New York. She stated that he made the long journey “with a view of getting Joseph to assist him in digging for a silver mine . . . on account of having heard that he possessed certain keys, by which he could discern things invisible to the natural eye” (Smith, Biographical Sketches, L. Smith, 91–92). On Nov 1, 1825, an Articles of Agreement was entered into by eleven shareholders, including Stowell and both Smith Jr. and Sr., clarifying how they would divide the anticipated spoils of their money digs in Pennsylvania (see Articles of Agreement, reprinted in Salt Lake Tribune, April 23, 1880). Having previously lost everything in a failed ginseng enterprise, Joseph Sr. had yet to regain financial stability. Russell Stoddard, a carpenter who labored on the Smith’s framed house, had sued Joseph Sr. for $66.59 that February for failure to compensate his labor. The Smiths owed many other creditors, and their mortgage was more than three years delinquent, the terms having already been graciously extended by the land agent to December 1825. Meanwhile, Stoddard managed to obtain the deed to the Smith property, after which he promptly moved to evict them. At the final hour, the Smiths managed to secure the favor of an old Quaker friend, Lemuel Durfee, who purchased the property. He allowed the Smiths to remain for an additional year in exchange for Samuel Smith’s help on his farm. Soon after, Joseph Sr. launched out with the Stowell company to pursue buried treasure in another state. Although previously discredited as a pre-trial examination, historians of Mormonism now accept the court transcripts of The People Vs. Joseph Smith, The Glass Looker on March 20, 1826, as a legitimate trial. BYU historian Marvin Hill observed: “Most historians, Mormon or not, who work with the sources, accept as fact Smith’s career as village magician. Too many of his closest friends and family admitted as much, and some of Smith’s own revelations support the contention” (Marvin S. Hill, Review of Roger Anderson, Joseph Smith’s New York Reputation Reexamined, BYU Studies Quarterly 30, No. 4). Given that no treasure ever materialized, Stowell’s nephew, Peter Bridgeman, became sufficiently concerned over Smith’s fleecing of his family and took legal action. In his complaint, he wrote: “Mr. Stowell is represented as being not a very bright man, but he had saved considerable money for those times, and Joe Smith managed to get and spend most of it” (Vogel, Early Mormon Documents 4: 153). Smith was arrested in March 1826 for disturbing the peace, a charge commonly used for charlatans and tricksters, including those “pretending to tell fortunes, or to discover where lost goods may be found.” Referred to as “The Glass Looker” in court documents, Joseph admitted to indulging in magic arts and organizing hunts for buried gold. New York law provided punishment for disorderly persons, whose definition included jugglers (conjurors), diviners, and those pretending to have skill in discovering lost goods. The charge aligns with uncle Jesse Smith’s description of Joseph: “He says he has eyes to see things that are not, and then has the audacity to say they are, and that the angel of the Lord . . . has put him in possession of great wealth, gold, silver, precious stones” (Jesse Smith, letter to Hyrum Smith, June 17, 1829, JS Letterbook 2: 59–61). Various witnesses testified at Joseph’s trial, including Jonathan Thompson, who told Judge Neely that he believed in Smith’s powers. He reported digging with the seer in pursuit of a “chest of money.” Thompson “struck his spade upon . 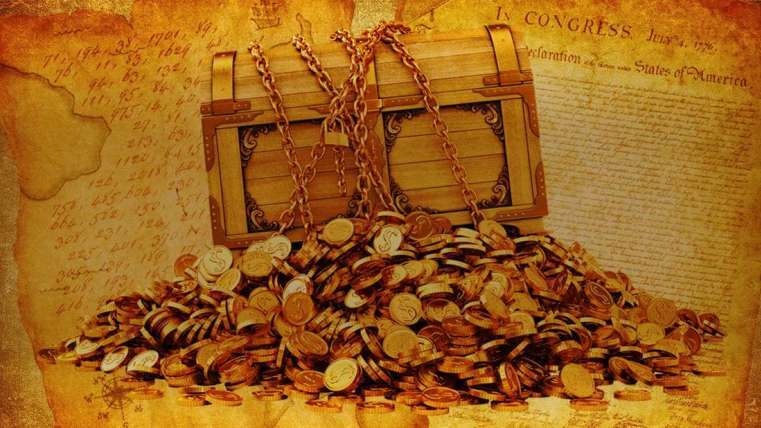 . . probably the chest, but on account of an enchantment, the trunk kept settling away from under them while digging.” Josiah Stowell similarly described a dig in which the “money moved down” beyond their reach. The story of Joseph Smith’s arrest and trial for money digging was published in the Salt Lake Messenger in 1971, shortly after the records were discovered. More important than Smith’s conviction, however, is how the records confirm his involvement in for-profit treasure seeking immediately before bringing forth the Book of Mormon. Historian Dale Morgan wrote: “It is immaterial what the finding of the court was on the technical charge of being a disorderly person and an imposter, what is important is the evidence adduced, and its bearing on the life of Joseph Smith before he announced his claim to be a prophet of God” (Dale Morgan, Dale Morgan on the Mormons, Part 2, 1949–1970, 87). Hugh Nibley, a prominent LDS scholar, observed: “[I]f this court record is authentic it is the most damning evidence in existence against Joseph Smith” (Hugh Nibley, The Mythmakers, 142). Joseph Smith Sr.’s testimony at the trial framed his son’s money digging enterprise in religious themes, asserting that “both he and his son were mortified that this wonderful power which God had so miraculously given him should be used only in search of filthy lucre, or its equivalent in earthly treasures.” He hoped the “son of Righteousness would someday illumine the heart of the boy, and enable him to see His will concerning him” (Morgan, On the Mormons, 195). While Joseph Jr.’s favorite brown seer stone lacked the ability to locate Spanish treasure for Stowell, and thereby save the family farm, the unassuming little rock would soon grant Smith the power to dictate the entire Book of Mormon that we know today. The notion of slippery treasure, guardian spirits, and curses reflects early American folklore. The Book of Mormon at various points describes a complaint common to nineteenth-century treasure seekers. “The inhabitants thereof began to hide up their treasures in the earth; and they became slippery,” wrote the prophet Mormon. The scene was evidently such that “there were sorceries, and witchcrafts, and magics . . . the land was cursed” (Morm. 1:18-19). Helaman wrote: “And behold, if a man hide up a treasure in the earth, and the Lord shall say—Let it be accursed . . . behold, it shall be accursed. And if the Lord shall say—Be thou accursed, that no man shall find these from this time henceforth and forever—behold, no man getteth it henceforth and forever” (Hel. 12:18-19), and “Yeah, we have hid up our treasures and they have slipped away from us, because of the curse of the land” (Hel. 13:35). In addition to testifying of the gold plates, Martin Harris later shared a fascinating story of his experience digging with the Smiths. “I will tell you a wonderful thing that happened after Joe had found the plates,” Harris wrote. “Three of us took some tools to go to the hill (Cumorah) and hunt for some more boxes, or gold or something, and indeed we found a stone box. We got quite excited about it and dug quite carefully around it, and we were ready to take it up, but behold, by some unseen power it slipped back into the hill. We stood there and looked at it, and one of us took a crow bar and tried to drive it through the lid to hold it, but it glanced and broke one corner of the box.” The three which Harris mentioned included Smith Sr., who “insisted upon it,” as well as Smith Jr. They reportedly broke off a chunk of the chest as it receded into the hill, retaining the piece as a memento (Quinn, Magic World View, 61–63). Joseph’s peep stone with carrying case. The brown stone and the term “Urim and Thummim” became synonymous to Smith. However, the only connection between the Urim and Thummim (which anciently refers to the colorful jewel elements of the breastplate worn by the temple High Priest) and seer stones is that they were both used as tools of divination (Lev. 8:8; 1 Sam. 14:41). Brigham Young demonstrated the interchangeable terms Smith used: “I met with the Twelve at Brother Joseph’s. He conversed with us in a familiar manner on a variety of subjects, and explained to us the Urim and Thummim which he found with the plates, called in the Book of Mormon the Interpreters. He said that every man who lived on the earth was entitled to a seer stone, and should have one, but they are kept from them in consequence of their wickedness, and most of those who do find one make an evil use of it; he showed us his seer stone” (Brigham Young, Millenial Star 26: 118, Dec. 27, 1841). Joseph’s family, friends, and neighbors bore witness to a very different process of obtaining the gold plates than what is commonly taught. Regarding this period of Smith’s life, Dan Vogel warned: “One must be cautious in reconstructing the original story, especially when citing portions that were influenced by Joseph’s later emendations” (Vogel, Making of a Prophet, 47). Martin Harris confirmed: “He found them [the gold plates] by looking in the stone found in the well of Mason Chase. The family had likewise told me the same thing. . . . It was by means of this stone he first discovered the plates” (Vogel, Early Mormon Documents 2: 309). Henry Harris, a contemporary of Joseph Smith’s, stated regarding the gold plates: “He looked in his stone and saw them in the place of deposit” (Affidavit of Henry Harris, circa 1833). Willard Chase recounted how Joseph told him that without the stone, “he would not have obtained the book” (Willard Chase affidavit, 1833). Another Palmyra resident, Orsamus Turner, recalled: “It was by looking at this stone in a hat, the light excluded, that Joseph discovered the plates” (John J. Hammond, The Creation of Mormonism: Joseph Smith Jr. in the 1820s, 64). John Gilbert, who typeset the Book of Mormon, recalled Smith telling him that “by the aid of his wonderful stone he found gold plates on which were inscribed the writings in hieroglyphics” (John H. Gilbert interview, The Detroit Post and Tribune, Dec 3, 1877). Willard Chase claimed that in 1827 Joseph Smith, Sr. told him “that some years ago, a spirit had appeared to Joseph his son, in a vision, and informed him that in a certain place there was a record on plates of gold; and that he was the person that must obtain them. He [Joseph Smith] then observed that if it had not been for that stone, he would not have obtained the book” (Willard Chase Statement, 11 Dec 1833, in Howe, Mormonism Unvailed, reprinted in Vogel, Early Mormon Documents 2: 71–72). Oliver Cowdery elaborated on how Smith was “prevented from obtaining the gold treasure by a thrice-repeated shock that was produced upon his system.” According to occult folklore, thrice repeated instructions from guardians or spirits signified truthfulness. Joseph made three attempts to obtain the plates from the Hill Cumorah on the evening of Sept 21, 1823, the day after the angel first visited him. Willard Chase, Joseph Knight, Lucy Mack Smith, and William Smith recounted various aspects of Smith’s attempts, including his astonishment when the plates unexpectedly disappeared, as well as how he was overpowered from touching them again after he had placed them on the ground. According to Smith, upon moving a large stone, he discovered the plates within a stone box. Lifting the plates from the hole, he set them on the ground to investigate if anything else “would be of some pecuniary advantage to him.” When he returned his attention the plates, they had disappeared from sight, returning to their location in the hole. Joseph again tried to retrieve them but “was hurled back upon the ground with great violence. When he recovered, the angel was gone.” His story is consistent with early American treasure-digging lore, which posited that treasure would disappear at the slightest breach of the guardian’s requirements. According to Oliver Cowdery, when Joseph reached out to take the plates, he received a “shock . . . upon his system” three different times. Joseph wondered if the enchantment prohibited him. He asked aloud, “Why can I not obtain this book?” The angel appeared and responded, “Because you have not kept the commandments of the Lord” (Oliver Cowdery to W. W. Phelps in Messenger and Advocate, Oct 1835). Folklore suggests that thrice repeated instructions from guardians or spirits signified truthfulness. Thus, it should also be no surprise that the Angel Moroni first appeared to young Joseph three times in one evening to repeat his instructions. Lucy Smith elaborated on the specific instructions Joseph had received from the guardian of the gold plates. He was “not to lay the plates down, or put them for a moment out of his hands, until he got into the house and deposited them in a chest or trunk, having a good lock and key.” On this task, Joseph failed. She further suggested that Joseph violated another provision when he allowed “covetous” desires to enter his mind (Smith, Biographical Sketches, 83–86). According to Joseph Smith, the angel provided further instruction to bring his elder brother Alvin the following year on an appointed date. The attestations of friends and family confirm the requirement to bring Alvin. Accounts differ regarding what transpired during subsequent visits. Joseph is said to have returned to Cumorah in 1824 without Alvin, who had passed away in November of the prior year. Unsuccessful once again in obtaining the plates, all accounts agree that the guardian required Smith to bring another person with him on the appointed date of September 22 of the coming year. While not providing specific instruction, Joseph was advised that he would know who the right person was. Joseph Knight recalled Smith explaining that he “might have the book if he brought with him the right person” (Joseph Knight, Reminiscences). Within days of Smith’s second unsuccessful visit to the hill in 1824, someone discussed exhuming Alvin Smith’s body. Perhaps a family member had mentioned the angel’s requirement that Alvin accompany Joseph, and the predicament his recent death precipitated. Some may have speculated that the Smiths would use Alvin’s body to satisfy the treasure guardian. 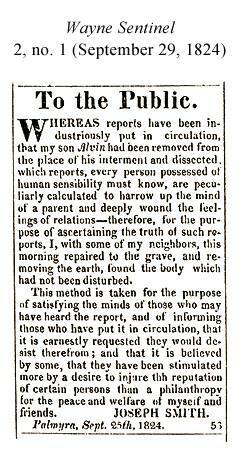 Joseph Smith Sr. printed a public notice in the Wayne Sentinel to address the rumors, reassuring the community that Alvin’s body was still buried and intact. Dan Vogel suggests “Joseph Sr.’s explanation for disinterring Alvin’s body is questionable because one should have been able to determine if the grave had been disturbed without exhuming the body. It seems probable, therefore, that Joseph Sr. himself may have been the source of the rumor, that the story was a ruse to exhume Alvin’s body for its use in attempting to get the gold plates” (Vogel, The Making of a Prophet, 57). Accounts of any visit to Cumorah in 1825-1826 are lacking. However, Joseph continued attempting to satisfy the guardian’s requirements. Willard Chase recommended fellow necromancer Samuel Lawrence as the man to accompany Smith to the hill. Samuel’s skill as a seer was known within the community. Willard Chase provided a detailed account of the period. Joseph revealed the general location of the plates to Lawrence, at which point he produced his own seer stone and inquired of Joseph if anything else accompanied the plates. Smith said “no,” prompting Lawrence to request that Joseph peer into his [Lawrence’s] stone. At first, Joseph could not see anything through the rock, but a second request came from Lawrence to “look again, and see if there was not a large pair of specks with the plates.” This unexpected turn of events presented both opportunity and risk to Smith. In acknowledging Lawrence’s vision, Smith became stuck with the spectacles that Lawrence introduced. Lawrence’s assistance and visionary prowess would, in turn, become validated by Smith, thus bolstering his reputation. Smith’s association with Lawrence was brief, as he quickly recognized him to be a competitor. He did not take Lawrence to the hill or attempt to retrieve the plates for some time. The historical record confirms that on the momentous night in 1827, Joseph tasked his father with keeping an eye on Samuel Lawrence to ensure he would not attempt to follow Joseph Jr. to search for Cumorah’s treasure (Knight, Reminiscences, 2. See also, Saints, Vol 1: The Standard of Truth, 36). Joseph still needed someone else to satisfy the guardian’s request. Smith determined by looking into his seer stone that the “right person” would be his future wife. Numerous friends and family members corroborated the guardian’s requirement that Joseph must be married, and she must accompany him the following September, lest the plates slip away forever. Joseph Knight, who at times employed and supported Joseph, recounted how Smith’s angel instructed him to “do right according to the will of God,” that he might obtain the plates the following year (See Knight, Reminiscences, 2). Lorenzo Saunders recalled: “Joseph said that he saw the angel again; the Angel told him he must go and get him a wife and then he could take his wife and . . . get the plates” (Lorenzo Saunders interview, Nov 12, 1884). “It was freely talked among the neighbors that Jo Smith said he had a revelation to go to Pennsylvania and get him a wife” (Sylvia Walker statement, March 20, 1885). Another neighbor recalled: “Jo told Emma he had a revelation about the plates, but that he could not obtain them until he had married her” (William R. Hine affidavit, 1885). Joseph Smith’s sister, Katharine, summarized the guardian’s requirement: “You will know her when you see her.” She elaborated: “That fall he went down to Pennsylvania and became acquainted with his wife, Miss Hale, and he knew when he saw her that she was the one to go with him to get the records.” Consulting the guidance of his seer stone, Joseph confirmed it was Emma Hale he was to marry. In preparation for his final attempt to obtain the plates, Joseph carefully followed occult protocol. He borrowed Joseph Knight’s black horse and a carriage. Joseph acquired black clothes, and there exists a receipt for the purchase of “lamp black” (paint) from the Palmyra store four days prior. Several friends and neighbors corroborated the requirement for total blackness during this critical visit to the hill, and Lucy Smith commented on this in her Biographical Sketches. Joseph’s sister stated that he was to appear at two o’clock—the powerful hour of Saturday morning over which his ruling planet Jupiter presided. Oliver Cowdery’s first published history of Smith used the terms “necromancy” and “enchantment” to describe this event. Emma’s cousin reported that “she stood with her back toward him while he dug up the box.” He then took the plates and hid them in a hollow black oak tree (Quinn, Magic World View, 147–66). Though the plates remained in the woods, Lucy Mack Smith reported that her son brought home the “specs,” which had been previously suggested by Samuel Lawrence. No one would ever see the spectacles, but Lucy felt them through a silk handkerchief in which Joseph had wrapped them. Lucy recalled: “Upon examination, [I] found that it consisted of two smooth three-cornered diamonds set in glass, and the glasses were set in silver bows, which were connected with each other in much the same way as old fashioned spectacles” (Smith, Biographical Sketches, 101). Smith’s retellings of this episode evolved over time. By 1838, Smith was suggesting he located the plates by the “distinctness of the vision which I had had concerning it” (Joseph Smith, Manuscript History). Later accounts never suggest that the plates were removed from the ground and avoid the details associated with the supernatural rules governing slippery treasure. Smith’s attempts to obtain the plates were said to have merely been forbidden by the messenger. 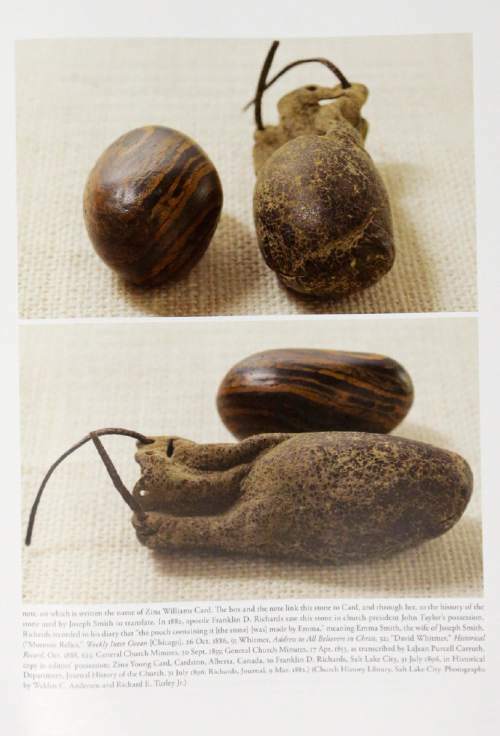 Joseph Smith’s treasure seeking activities via his various peep stones did not terminate with the formation of The Church of Christ or printing of the Book of Mormon. In August 1836, Smith read an Ohio Telegraph newspaper story of treasure allegedly hidden under a house, and discussed the article with Ebenezer Robinson, a boarder in his home. Desperate with debts he could not pay, Smith traveled to Salem, MA in search of the buried treasure. In persuading them to attend, Smith told Sidney Rigdon, Oliver Cowdery and his brother Hyrum that it was missionary tour. Joseph and his comrades stayed for weeks, tracking down clues. Confirming both the purpose of his “mission” and enthusiasm for the pursuit of the prize, Joseph wrote his wife Emma on Aug 19, “with regard to the [great] object of our mishion [sic] you will be [anxious] to know, we have found the house . . . very luckily and providentially, as we have one spell been most discouraged.” As the prophet plotted to obtain the house and treasure, he reported, “The house is occupied, and it will require much care and patience to rent or buy it.” Smith soon returned to Kirtland empty-handed, leading many to downplay the awkward fact that the entire Presidency was involved in the failed treasure scheme. In the Book of Mormon, the finger of God illuminated sixteen Jaredite stones. Smith claimed that these stones became the Urim and Thummim that accompanied the gold plates. Joseph’s original revelation to Oliver Cowdery stated that Oliver had the “gift of working with the sprout” or the “rod of nature.” When compiling the Book of Commandments, this revelation was altered to refer to his “gift of working with the rod” (BoC 7:3). As revelations were compiled into the Doctrine & Covenants, this revelation referring to his divining sticks was again reworded to the “gift of Aaron” (D&C 8). Reliance upon rods and canes for divine inspiration remained a theme of early Mormonism. Heber C. Kimball repeatedly recorded the inspiration his “rod” [likely a cane] channeled. “I inquired by the rod. It was said my family was well that my wife would come to me in the east” (Heber C. Kimball journal, June 6, 1844). Kimball’s use of the rod continued: “he went home and used the rod” (Heber C. Kimball journal, Sept. 5, 1844); and “The same evening I sat down in my house in the presence of my wife and inquired of the lord by the rod” (Heber C. Kimball journal, Jan 25, 1845). In later years, Heber continued to favor his staff, recording that “in the evening it was told me by the Lord rod” (H. C. Kimball memorandum, January 21, 1862). Kimball’s later autobiography had the word rod removed from the text. The Smith family created various parchments, likely used to channel mystical energies. The symbols appear to have been copied from occult handbooks, including Francis Barrett’s The Magus, published in 1801. Some historians propose that the parchments were mere “heirlooms” of the Smith family, lacking a confirmed provenance. However, the historical record today provides some context for these cherished items. One primary parchment was titled “Holiness to the lord,” the same title affixed above temple entrances today. Acts 19:12 illustrates how the Apostle Paul sent special handkerchiefs among the people to heal them. In 1837, Latter-day Saint apostles wrote: “Many scores of persons were healed by our sending a handkerchief to them.” In 1839, Smith gave a handkerchief to a faithful member to alleviate his sick child, suggesting that the cloth would deliver healing powers. There are numerous recorded instances of attempted faith healing via handkerchiefs (Quinn, Magic World View, 313-14). Smith occasionally carried a cane with astrological symbols carved around a crown and serpent head. Following Joseph and Hyrum’s death, wood from their caskets was cut into strips and turned into canes. Various canes were distributed among Church leaders; many were blessed in the temples. President Heber C. Kimball spoke in the Salt Lake Tabernacle on March 15, 1857, expounding upon the certain powers of coffin canes. (Journal of Discourses 4: 294). “Early Americans openly demonstrated their enthusiasm for astrology [and] occult sciences. Folk astrology was based on the maxim that people should ‘do nothing without the assistance of the Moon.’ In the 1800s, rationalists opposed the use of astrology in decision-making, yet even many critics admitted that planets and stars directly influenced humanity” (Quinn, Magic World View, 21–23). The scientific method and modern medicine came of age in Joseph Smith’s day. Speculative practices such as astrology had not yet diverged from what would become mainstream science. The astrological dominance of Jupiter in Joseph’s life is well documented and inscribed on numerous ritual items. The date of Smith’s annual visits to Hill Cumorah coincided with the autumnal equinox. Even the date of Joseph’s marriage to Emma aligns with Jupiter’s astrological power. Joseph possessed a silver talisman approximately the size of a large coin that contained astrological symbols, which was often referred to as a “silver piece.” Scholars have attempted to ascribe Masonic origin to various artifacts, but they were clearly astrological. Mike Quinn has thoroughly demonstrated how the talisman as well as the Smith family’s Mars dagger both relied on Barrett’s The Magus as their source. 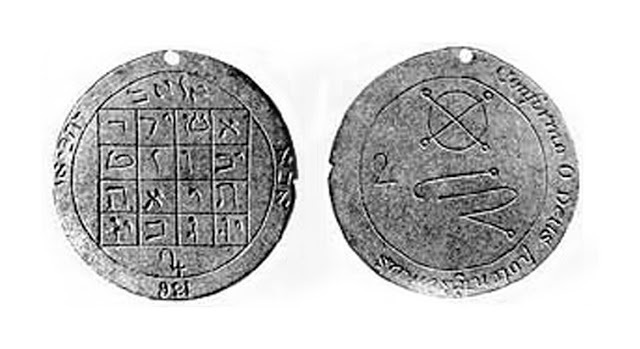 Smith retained the Jupiter talisman on his person until his death in Carthage, stating that it functioned as a personal protector. Nearly every major vision or event in Smith’s life aligns with the astrological timing of Jupiter and the moon. “It is interesting to note,” observes one scholar, “that Smith specifically recalls the exact date of this first Moroni appearance while providing only a general time frame, spring of 1820, for his vision of God and Christ. September 21 was a day of great significance. There had been a full moon the night before, and the time of the full moon was considered advantageous to search for buried treasure. The Key of Solomon says in its first chapter that without knowing the “order of hours and of days, and of the position of the moon, the magician’s efforts will be of no effect” (Clay L. Chandler, “Scrying for the Lord: Magic, Mysticism, and the Origins of the Book of Mormon,” Dialogue: A Journal of Mormon Thought 36, No. 4). Joseph Smith’s journal presents an entry on March 14, 1843, as recorded by Willard Richards, that was likely prompted by the widely-observed Great March Comet of 1843. 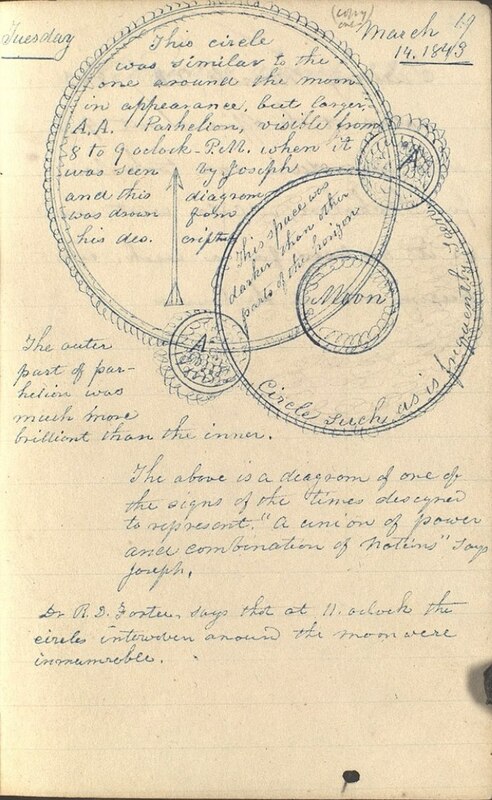 Richards sketched the phenomena, titled Observations in the Night Sky, as Smith dictated a mystical interpretation of a moon halo and sword-shaped comet tail. The Magus instructs: “you must observe the Moon…for you shall do nothing without the assistance of the Moon” (Barrett, The Magus, 148). Joseph Smith suggested it was a sign of the times, representing “a union of power and combination of Nations.” Smith further elaborated on the astrological event during the April 6 Conference, relating “signs in the heavens above on the earth beneath” to the return of Christ. Church newspapers further discussed the phenomenon. The historical record is clear that occult and folk magic practices played a significant role in not only Joseph Smith’s early career as a treasure seeker but also the formation and development of the Church. How scholars and historians interpret the role of folk magic in Smith’s life largely depends on their view of his prophetic role. 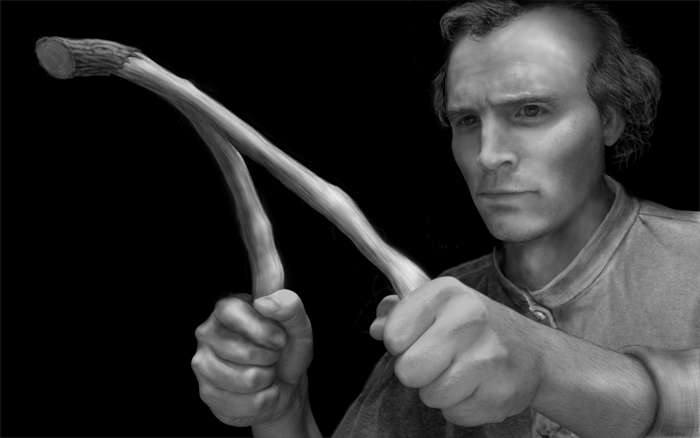 While some scholars may reduce Smith’s treasure digging and seer stone usage as innocent preparation for a higher calling, others are unsatisfied by this reductionist explanation and point to numerous other historical facts that support a magical view that lies at the heart of Joseph Smith’s religious innovations. Still, others find Smith’s use of folk magic and treasure digging to be evidence of charlatanism that continued with the fabrication of the gold plates and the Book of Mormon. Dan Vogel is (in my opinion) the preeminent living scholar on Joseph Smith. Recently I was fortunate enough to spend 8 hours with Dan, discussing: 1) his life story, 2) his research and perspectives on Joseph Smith’s participation in folk magic and treasure digging, and 3) his views on how the Book of Mormon was written. In conjunction with our new Mormon Stories Podcast “Truth Claims” initiative (which includes new web content and a billboard along the I-15 corridor), I share with you today part 2 of my interview with Dan Vogel, focusing specifically on Joseph Smith’s treasure digging. I hope you will enjoy this as much as I did. Join us as we sit down with John Hamer, historian of the Latter-day Saint movement and a Seventy in Community of Christ to try to understand some of the basics of Mormon Origins. In this first episode of the series, we will look at the Smith family’s folk magic and folk religious background in context. We also have an important discussion about how practitioners of folk magic believe (or not) in the authenticity of their practice, including whether or not the Smith’s believed in theirs. Kathleen Melonakos’s book Secret Combinations: Evidence of Early Mormon Counterfeiting (1800-1847) has created buzz in many online Mormon communities and we are excited to launch our series with Kathleen’s expertise and careful research. Her book chronicles the evidence that early Mormon leaders, starting with Joseph Smith Sr., dealt in counterfeit money beginning in Vermont, and continuing throughout Joseph and Hyrum’s careers. It places the Smith brothers in the early American context where counterfeiting networks and some of their CEO-like bosses posed as preachers. It is the only book of its kind that uncovers the problems counterfeiters caused in early America and what really happened before, during and after the Book of Mormon appeared on the scene. Her book is both fact-based and fast moving, supported by more than 1400 footnotes and over 100 photos and illustrations. It is also based on nearly 10 years of research conducted in Vermont, New York, Illinois, Missouri, and Utah. In this interview, Kathleen attempts to provide the historical context for the life of the Smith family and the founding of the LDS Church. In particular, we focus on the counterfeiting culture of the time period (Part 1), treasure digging as a practice (Part 2), the origins of the Book of Mormon (Part 3), and finally we delve into how her research and work influences Kathleen’s personal beliefs (Part 4). In part 2 of this multi-part interview with Dr. Richard Bushman, the world’s foremost scholar on Joseph Smith and early Mormonism and author of Joseph Smith: Rough Stone Rolling, we tackle 4 main topics. First, brother Bushman provides a high level review of the major Joseph Smith biographies that preceded Rough Stone Rolling, including Fawn Brodie’s “No man knows my history.” Next, brother Bushman discusses the art of writing history, and the challenges involved in trying to arrive at “the facts” and “the truth” for both historians, and readers of history. Finally, we discuss in depth the first 2 of our top 10 tough Joseph Smith issues: 1) The multiple and somewhat varying accounts of Joseph Smith’s first vision story, and 2) Joseph Smith’s involvement in folk magic and treasure digging. Grant Palmer takes us through a deep dive into his 1st book–An Insider’s View of Mormon Origins. During this episode we cover Joseph Smith’s treasure seeking and usage of peep stones, the actual mechanics of the Book of Mormon translation process, the recorded accounts of the witnesses to the Book of Mormon, the multiple versions of Joseph Smith’s First Vision story, and the evolution of the LDS Priesthood accounts over time. For decades, and heavily over the past ten years, Mormon historians, podcasters, and critics have been urging the LDS Church to be more open and honest about Joseph Smith’s use of folk magic and a peep stone/hat in his production of the Book of Mormon text. An October 2015 Ensign article is set to appear called “Joseph the Seer” which attempts to explain Joseph’s practice of using a seer stone.